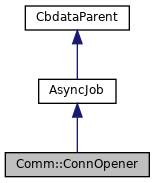 Async-opener of a Comm connection. Definition at line 25 of file ConnOpener.h. Definition at line 32 of file ConnOpener.h. Definition at line 33 of file ConnOpener.cc. Definition at line 46 of file ConnOpener.cc. Definition at line 388 of file ConnOpener.cc. References calls_, conn_, debugs, and Comm::ConnOpener::Calls::sleep_. Definition at line 153 of file ConnOpener.cc. References calls_, AsyncCall::cancel(), comm_remove_close_handler(), COMM_SELECT_WRITE, conn_, debugs, Comm::ConnOpener::Calls::earlyAbort_, fd_table, HERE(), Must, NULL, Comm::SetSelect(), temporaryFd_, fde::timeout, Comm::ConnOpener::Calls::timeout_, fde::timeoutHandler, fde::write_data, and fde::write_handler. Referenced by closeFd(), and keepFd(). Definition at line 199 of file ConnOpener.cc. References cleanFd(), comm_close, and temporaryFd_. Referenced by retrySleep(), and swanSong(). Definition at line 306 of file ConnOpener.cc. References conn_, Comm::Connection::fd, fd_table, Comm::Connection::getPeer(), keepFd(), Comm::Connection::local, lookupLocalAddress(), Must, Comm::OK, sendAnswer(), and temporaryFd_. Create a socket for the future connection or return false. If false is returned, done() is guaranteed to return true and end the job. Definition at line 258 of file ConnOpener.cc. References assert, callback_, calls_, AsyncCall::canceled(), comm_add_close_handler(), comm_openex(), conn_, deadline_, debugs, earlyAbort(), Comm::ConnOpener::Calls::earlyAbort_, Comm::ERR_CONNECT, fd_table, CachePeer::flags, Comm::Connection::flags, host_, Ip::Address::isIPv4(), JobCallback, Comm::Connection::local, Must, Comm::Connection::nfmark, NULL, CachePeer::params, Comm::Connection::remote, sendAnswer(), Ip::Qos::setSockNfmark(), Ip::Qos::setSockTos(), squid_curtime, Squid_MaxFD, temporaryFd_, timeout(), Comm::ConnOpener::Calls::timeout_, and Comm::Connection::tos. Referenced by restart(), and start(). Definition at line 472 of file ConnOpener.cc. References assert, data, JobCallback, restart(), ScheduleCallHere, and CbcPointer< Cbc >::valid(). Definition at line 335 of file ConnOpener.cc. References comm_connect_addr(), COMM_SELECT_WRITE, Config, conn_, SquidConfig::connect_retries, connected(), debugs, Comm::ERR_CONNECT, failRetries_, HERE(), Comm::INPROGRESS, InProgressConnectRetry(), Must, NULL, Comm::OK, Comm::Connection::remote, retrySleep(), sendAnswer(), Comm::SetSelect(), temporaryFd_, totalTries_, and xstrerr(). Referenced by InProgressConnectRetry(), restart(), and start(). Definition at line 52 of file ConnOpener.cc. References callback_, calls_, AsyncCall::canceled(), conn_, AsyncJob::doneAll(), Must, NULL, Comm::ConnOpener::Calls::sleep_, and temporaryFd_. Abort connection attempt. Handles the case(s) when a partially setup connection gets closed early. Definition at line 430 of file ConnOpener.cc. References calls_, CommCommonCbParams::conn, debugs, Comm::ConnOpener::Calls::earlyAbort_, Comm::ERR_CLOSING, HERE(), NULL, sendAnswer(), and CommCommonCbParams::xerrno. Definition at line 101 of file ConnOpener.cc. Definition at line 454 of file ConnOpener.cc. References assert, data, doConnect(), JobCallback, ScheduleCallHere, and CbcPointer< Cbc >::valid(). Definition at line 218 of file ConnOpener.cc. References cleanFd(), conn_, Comm::Connection::fd, Must, NULL, and temporaryFd_. Definition at line 409 of file ConnOpener.cc. References addr, addrinfo::ai_addr, addrinfo::ai_addrlen, conn_, DBG_IMPORTANT, debugs, Comm::Connection::fd, Ip::Address::FreeAddr(), HERE(), Ip::Address::InitAddr(), Comm::Connection::local, NULL, and xstrerr(). Referenced by HttpStateData::abortAll(), Ftp::Client::abortAll(), Comm::TcpAcceptor::acceptOne(), Adaptation::Ecap::XactionRep::adaptationAborted(), Adaptation::AccessCheck::callBack(), AsyncJob::callException(), Security::PeerConnector::connectionClosed(), HttpStateData::continueAfterParsingHeader(), Ftp::Client::ctrlClosed(), Adaptation::Iterator::handleAdaptationBlock(), Adaptation::Iterator::handleAdaptationError(), Log::TcpLogger::handleClosure(), Adaptation::Icap::Xaction::handleCommClosed(), Http::Tunneler::handleConnectionClosure(), Mgr::Forwarder::handleError(), Ipc::Forwarder::handleError(), Ipc::Forwarder::handleException(), Ipc::Inquirer::handleException(), HttpStateData::handleMoreRequestBodyAvailable(), Ipc::Inquirer::handleRemoteAck(), Ipc::Forwarder::handleTimeout(), HttpStateData::httpStateConnClosed(), HttpStateData::httpTimeout(), noteAbort(), Adaptation::Icap::ModXact::noteBodyConsumerAborted(), Snmp::Forwarder::noteCommClosed(), Snmp::Inquirer::noteCommClosed(), Mgr::Inquirer::noteCommClosed(), Mgr::Forwarder::noteCommClosed(), Mgr::StoreToCommWriter::noteCommClosed(), Adaptation::Icap::Xaction::noteCommRead(), Rock::HeaderUpdater::noteDoneReading(), Adaptation::Iterator::noteInitiatorAborted(), Adaptation::Icap::Xaction::noteInitiatorAborted(), Adaptation::Ecap::XactionRep::noteInitiatorAborted(), HttpStateData::readReply(), sendAnswer(), Rock::Rebuild::start(), Security::PeerConnector::start(), HttpStateData::start(), Ipc::UdsSender::timedout(), and HttpStateData::wroteLast(). Definition at line 30 of file ConnOpener.h. Definition at line 246 of file ConnOpener.cc. References calls_, conn_, createFd(), debugs, doConnect(), and Comm::ConnOpener::Calls::sleep_. Definition at line 376 of file ConnOpener.cc. References calls_, closeFd(), DelayedConnectRetry(), eventAdd(), Must, and Comm::ConnOpener::Calls::sleep_. Connection attempt are completed. One way or the other. Pass the results back to the external handler. Definition at line 111 of file ConnOpener.cc. References callback_, AsyncCall::canceled(), Config, conn_, debugs, host_, AsyncCall::id, ipcacheMarkBadAddr(), ipcacheMarkGoodAddr(), AsyncJob::mustStop(), netdbDeleteAddrNetwork(), NULL, SquidConfig::onoff, CachePeer::params, Comm::Connection::remote, ScheduleCallHere, and SquidConfig::test_reachability. Referenced by connected(), createFd(), doConnect(), earlyAbort(), swanSong(), and timeout(). Definition at line 89 of file ConnOpener.cc. References host_, NULL, safe_free, and xstrdup. Referenced by Ftp::Client::connectDataChannel(), idnsInitVC(), peerProbeConnect(), and TunnelStateData::startConnecting(). Definition at line 230 of file ConnOpener.cc. References conn_, createFd(), doConnect(), Ip::EnableIpv6, IPV6_SPECIAL_V4MAPPING, Ip::Address::isIPv4(), Comm::Connection::local, Must, Comm::Connection::noteStart(), NULL, Comm::Connection::remote, and Ip::Address::setIPv4(). Definition at line 70 of file ConnOpener.cc. References callback_, calls_, cancelSleep(), closeFd(), Comm::ERR_CONNECT, NULL, sendAnswer(), Comm::ConnOpener::Calls::sleep_, AsyncJob::swanSong(), and temporaryFd_. Handles the case(s) when a partially setup connection gets timed out. NP: When commSetConnTimeout accepts generic CommCommonCbParams this can die. Definition at line 443 of file ConnOpener.cc. References calls_, conn_, debugs, HERE(), NULL, sendAnswer(), Comm::TIMEOUT, and Comm::ConnOpener::Calls::timeout_. Definition at line 74 of file ConnOpener.h. 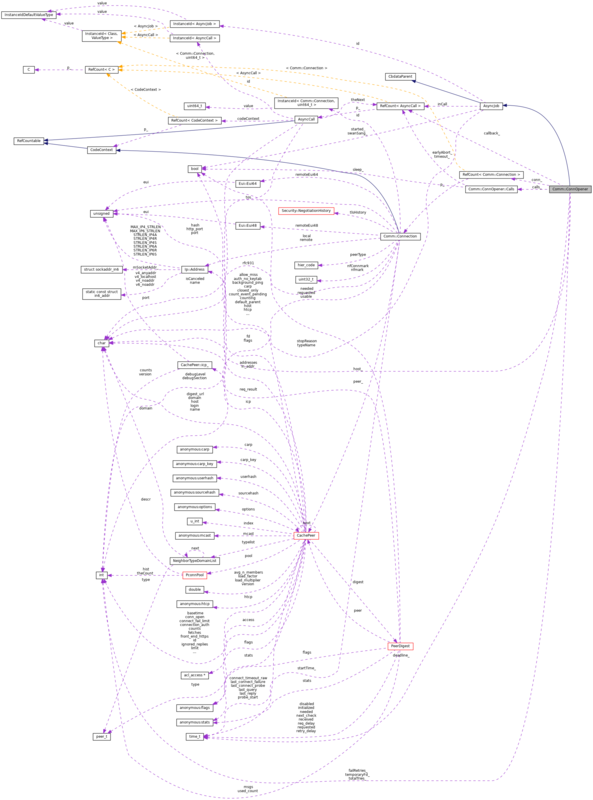 Referenced by createFd(), doneAll(), sendAnswer(), and swanSong(). Referenced by cancelSleep(), cleanFd(), createFd(), doneAll(), earlyAbort(), restart(), retrySleep(), swanSong(), and timeout(). Definition at line 73 of file ConnOpener.h. Referenced by cancelSleep(), cleanFd(), connected(), createFd(), doConnect(), doneAll(), keepFd(), lookupLocalAddress(), restart(), sendAnswer(), start(), and timeout(). Definition at line 80 of file ConnOpener.h. Definition at line 77 of file ConnOpener.h. Definition at line 71 of file ConnOpener.h. Referenced by createFd(), getHost(), sendAnswer(), setHost(), and ~ConnOpener(). Definition at line 72 of file ConnOpener.h. Referenced by cleanFd(), closeFd(), connected(), createFd(), doConnect(), doneAll(), keepFd(), and swanSong(). Definition at line 76 of file ConnOpener.h.